After the Duplass brothers’ no-budget 2005 debut feature The Puffy Chair put them on the map, they followed up by poking fun at their own DIY aesthetic in Baghead, which follows four friends who want to make a movie, but are creatively bankrupt. Heading to the woods for a weekend of inspiration, they eventually devise the idea of a Blair Witch docu-horror movie about an intruder with a bag over his head—which turns out to be both the laziest imaginable conceit and ironically effective as a scare machine, onscreen and off. Patrick Brice’s writing and directing debut Creep—premièring digitally on iTunes just a few days after the theatrical bow of his audacious second feature, The Overnight—offers further proof that heading to the woods with a Duplass brother is a winning horror formula, though Brice’s conceit is more rigorously thought-through. Brice stars as Aaron, a videographer who answers a cryptic Craigslist ad offering $1,000 for a day of filming in a remote mountain locale in northern California. He arrives to a grinning simp named Josef (Mark Duplass), who claims he has two or three months to live, and wants Aaron to film a video that can be shown to his unborn son, much like Michael Keaton’s character in My Life. The first scene: Josef in the bath, pretending to have “tubby time” with an invisible baby. Then he breaks out a wolf mask dubbed “Peach Fuzz.” Things get progressively more disturbing from there. 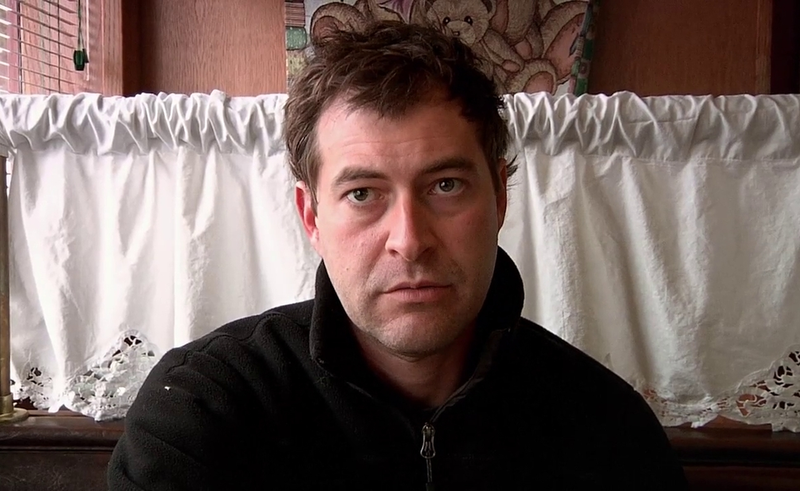 Though Creep doesn’t exactly reinvent the found-footage form, Brice knows the genre well enough to do a little tweaking: Rather than supplying the requisite jump scares, Brice’s solution is to turn Josef into a human jump scare, given to popping up out of nowhere because he has a sick sense of humor. There’s an element of Baghead-style self-consciousness to the way Josef has been conceived, as if the character is fully aware of his status as a horror-movie villain, and playing that role to the hilt. Josef also knows how much he can push Aaron without losing him completely, following unsettling displays of his psychosis with earnest pleas for sympathy. For his part, Aaron reacts just as a normal person would in that situation, indulging Josef’s quirks until enough of them mount to heighten his discomfort and have him plotting a graceful exit. Once he does, the film takes some unexpected turns, aided by some gaps between when the camera is on and off—and in one chilling scene, when the camera is off, but the sound is still running. While Creep has the limited scope of DIY filmmaking at its most rudimentary, that contributes to a tone that’s unusually playful and entertaining without coming off as a lark. As an actor, Duplass specializes in handsome bastards whose natural charisma can curdle into smarm, and Brice and Duplass gently turn the screw on that image, giving Josef the quality of an ingratiating psychopath, someone capable of reeling in strangers like fish on a line. Though the shooting itself is found-footage by-the-numbers, Brice includes a few terrific structural surprises that whisk the film in new directions, even though they lead to a sequence of events down the stretch that rely on suspect decision-making. (So suspect, in fact, that one such decision is openly questioned.) But the deftness and humor of The Overnight are present throughout Creep, too, which is especially refreshing in a genre that more often encourages gore and a dirge-like atmosphere. Creep gives the impression that Brice and Duplass had a grand old time making it—and that lessens the scares not a whit.